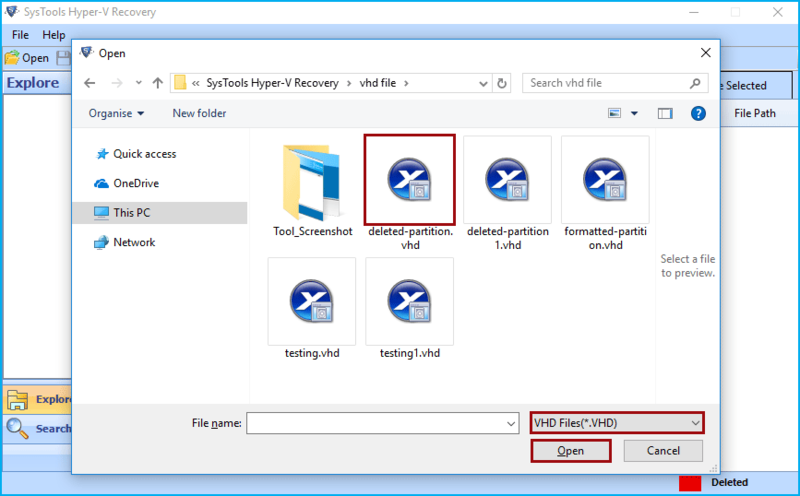 SysTools VHD Recovery Software is a complete Wizard to recover deleted file from VHD and VHDX file. The tool supports VHDX data recovery even from corrupted VHD & VHDX file. So, you have to just download VHDX data recovery software and install on the Windows 10, 8, 7 etc. The Tool ensures for complete recovery from corrupted, deleted and formatted VHDX & VHD file. Assured data recovery from corrupt/damaged, dismounted .vhd file/partition. Retrieve healthy VHD file data (with exact file name, type, size etc) without installing Virtual environment. Recover dynamic and static .vhd / .vhdx of FAT (16, 32) & NTFS file systems (4, 5, 8). The VHDX Recovery Software is compatible all Windows OS Version like Win 10, 8.1, 8, 7, Vista, XP etc. Simply Download and Install the tool and recover deleted file from VHDX and VHD. Software Informer gives SysTools VHD File Recovery Software 100% secure and clean award for its best performance. SysTools Hyper-V VHD Recovery Software got the 4 stars rating from Cnet for its efficient working with VHD & VHDX File. SysTools VHD Recovery Wizard is all in one software. Because it support deleted files recovery from VHDX. The tool support to recover data from dismounted VHD and VHDX file. Also, the software is capable to retrieve lost files from Hyper-V, Windows backup, Xen Server created .vhd and .vhdx file easily. 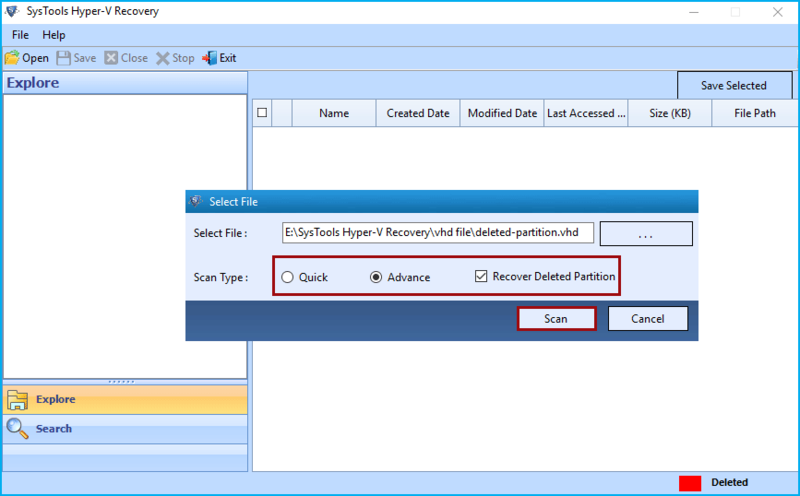 SysTools VHDX Recovery Tool provides an advance feature i.e. recover deleted partition from virtual hard disk. I personally checked this feature and found desired result. It makes the .vhd recovery process quite easy. Due to simple GUI a novice user can also recover deleted files from VHD and VHDX. I accidentally deleted NTFS partition from VHD file. After taking demo of various virtual disk data recovery software. I came to know about SysTools VHD Data Recovery Software. I installed this software on Windows 10 laptop and it easily recovered deleted partition from .vhd file. I recommend to use this. My Hyper-V .vhdx file is corrupted and I was unable to mount it. To overcome this issue I searched for solution on internet. Luckily I found SysTools VHDX recovery software and install on my windows computer. It recovered corrupted .vhdx file data and enable to search required files by applying filters. 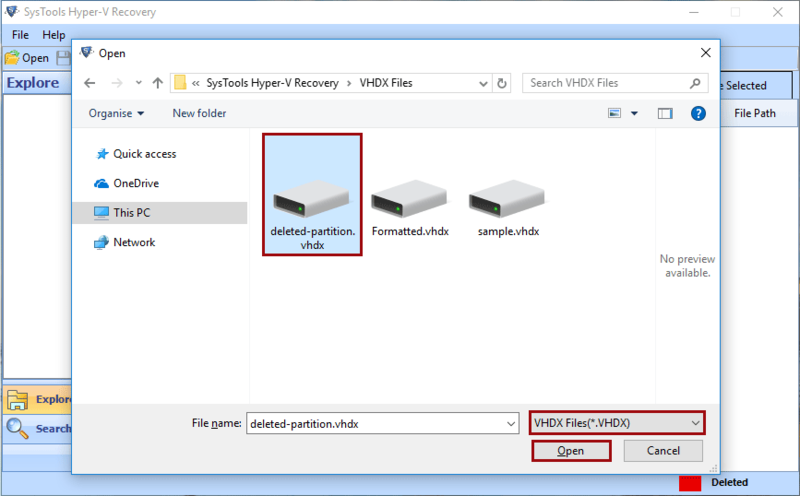 Option to Recover Deleted File From VHDX: The tool has potential to restore shift+delete files from VHDX file. After recovery, deleted files are highlighted in red colour. So that users can easily differentiate .vhdx files in resultant data fies. Afterwards, users can save all the recovered files in an absolute way. Restore Files From Formatted VHDX: Another impressive feature is the tool supports to recover files from formatted VHDX partitions. This software helps to recover formatted .vhdx files as either NTFS or FAT file system. Recover Static & Dynamic VHDX: Dynamic or static VHDX files can be recovered with the help of VHDX Recovery tool. For dynamic VHDX, it will support NTFS & FAT 32 and for static VHDX, it will support all types of file system. This application is designed to recover deleted files from VHD, including videos, images, database, archive and so on. In addition, the software also supports to recover formatted, corrupted and unhealthy VHD file. Also, support to recover deleted partition from VHD. Retrieve Formatted Files from VHD: With this utility, users can retrieve files from formatted VHD partitions. This tool also supports a cross-format whether VHD is formatted in NTFS or FAT file system. Restore Shift Deleted Files from VHD: The tool recovers deleted files from VHD data file. Once the recovery is done, the software will highlight permanently deleted files in red. After that, users can save recovered files easily. Recover Deleted Partition from VHD: It is capable enough to restore VHD file from both FAT and NTFS partition. It supports both NTFS and FAT 32 for Dynamic VHD and for Fixed VHD it supports all file systems. 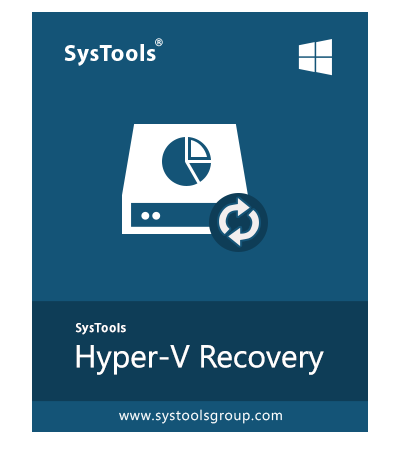 SysTools Hyper-V Recovery software for Windows let you restore your VHD data along with videos, audio, images, archive, database etc. 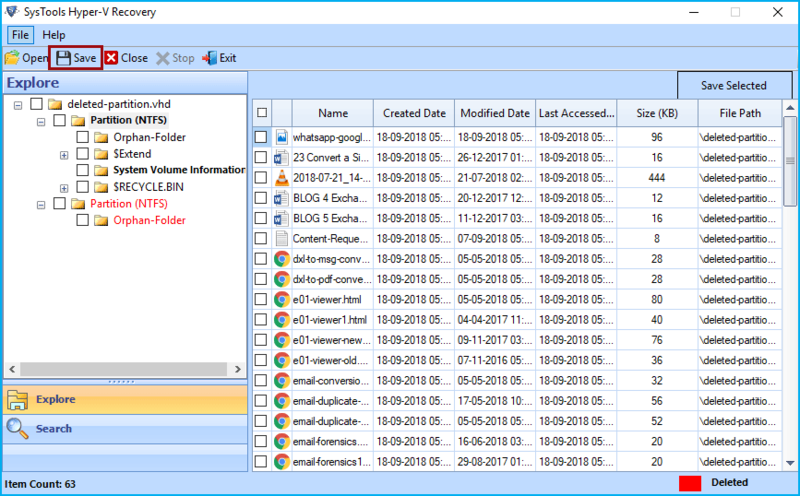 VHD data recovery tool offers advance scanning options thus recovering the items from emptied recycle bin, folder and partition stored in VHD files. The VHDX recovery software is capable to recover deleted files from VHDX file. After the successful recovery, the tool will highlight the permanently deleted data in red colour. So that the user can easily distinguish the .vhdx deleted files in resultant file. After recovery user can easily Save the recovered files. Latest version of the software saves scanning report of partition. This feature helps minimize time consumption and gives the facility to load previously scanned details of that particular partition when it needs to be rescanned. Software prompts whether you want to save the scanned data or not. If you command it yes, the scanned data will get saved for future reference. If the .vhdx partition formatted and files lost then download this VHD recovery software and install on any version of Windows OS. The tool is capable enough to restore files from formatted VHDX & VHD partitions. The Tool also supports cross-format .vhdx recovery. It does not matter that the .vhdx is formatted in NTFS or FAT file system. Data from the Virtual Hard Disk, formed as a part of virtualization of system with Windows OS, can completely be recovered with the Hyper-V VHD recovery software. Hyper-V data recovery tool is designed with advanced algorithms to ensure successful and easy VHD file recovery of permanently deleted data. After the successful VHDX recovery, it becomes quite necessary to search required file easily. So, to empower user the .vhd recovery tool provides an advance search feature. Here you need to just provide some information of file which you want to filter, like creation data, modify date, file extension etc. And the tool will short all files. Safely recover VHD file data from both FAT (16, 32) and NTFS (4, 5, 8) partition with Windows Hyper-V Recovery software. It will support NTFS & FAT 32 for for Dynamic VHD and for Fixed VHD file it support all file systems. If you have created virtual hard drive of VHD or VHDX extension and lost files from it. Then try this vhdx recovery software, it will easily recover deleted files from VHDX & VHD hard disk. The software is capable to recover all type data of any size. There is not any files size and partition size limitation. An internal search option is incorporated within the VHD recovery software. With the help of this option, it is possible to find out any specific item present within the VHD file. You only need to type name of file or the file extension and software will list all the items present in it matching your search. When Windows Hyper-V virtual environment via created data stored in VHD files get corrupted show error messages. With Hyper-V Recovery tool you will able to remove all such possible errors and recover corrupted VHD file data easily in a healthy form. Once the VHDX recovery software scans corrupt VHD / VHDX and recovers the data in it, an instant preview of it is generated. You can view emails, documents, images etc. ; found in VHD file partition. The software will preview only selected type of files like: documents, PDF, emails, text files and likewise. There are various scanning modes available to recover corrupt VHD file data. Quick scan mode for minimally corrupted VHD files and Advance scan mode for severely corrupted VHD files. For resolution of MBR corruption in VHD file, raw scan mode comes handy. It also helps to search for entire files for finding the disappeared partition. Raw scan only runs when the VHD is fixed. Dynamic as well as static VHD file stored data can be recovered with the Hyper-V Recovery software. Virtual PC recovery tool ensures that data from the uncountable VHD files can also be recovered but each one at a time. Also, healthy VHD files from an un-installed virtual environment can be recovered with VHD file repair tool. After the complete recovery of lost files from virtual disk, the VHDX recovery tool allows you to save output data at desirable location. Complete data will be saved with all Meta property retained and complete folder structure maintained. Also, you can check or uncheck the folders to save only selective files or items. Demo version of Hyper-V Recovery software generate preview of recovered data from the loaded and selected VHD & VHDX file. How to Recover Data from Corrupt VHD File Using This Tool? Perform the steps mentioned below to recovery data from corrupt VHD or VHDX file using this VHD data recovery software. Download Hyper-V Data Recovery Software. Browse .vhd or .vhdx file into Tool. View Permanently Deleted Data in Red Crossed Marked Folder. Extract selected or Complete VHD & VHDX File Data. Save Recovered VHD File Data at any Location. Will this VHDX recovery tool be compatible with my Windows 10 configured computer? Yes, the software is fully compatible with all Windows OS versions and has no performance issues with Windows 10 environment. How much time will it take to recover deleted data from VHD file of size 193 GB? Total time taken by this VHD recovery software, primarily depends upon two factors; size and corruption level of the VHD or VHDX file. Large size and severe corruption of VHD consumes more time in getting processed than a small sized less corrupted VHD. Can I recover deleted files from VHD in bulk? No, software will only let you to add one VHD or VHDX file at a time. And you can perform recovery of Virtual Hard Disk files one by one only. Will I be able to recover lost data from VHD with demo version of this software? Yes, demo version of the tool will only give you the preview of recovered data from corrupted VHD files. To save that data on your computer in its native format, you need to purchase full version of VHDX data recovery software. Can I repair corrupted / inaccessible VHD or VHDX files? No, the software will not repair corrupt VHD or VHDX file. The software support to recover data from corrupt VHD file. The recovered data can then be extracted in its original format respectively. Does the software support to recover deleted data from VHDX file? Yes, The Hyper-V File Recovery Software support to recover deleted, formatted and corrupted files from VHD and VHDX. What does the "Red Cross" on folder in left panel of tool mean? Data marked with a "Red Cross" denotes a recovered data which was damaged due to corruption or deleted. Is the tool capable to recover deleted partition from VHDX? Yes, The VHDX Recovery Tool is capable to recover permanently deleted partition from VHDX and VHD files easily. Does software support Dynamic VHD files for recovery? Hyper-V Recovery Software supports Dynamic as well as static VHD files recovery of FAT 32 and NTFS file system. Why am I receiving "Sorry, incorrect file type" error even when adding a valid VHD? If the software prompts this error, please check whether your file extension is '.vhd' or '.VHD'. If it is .VHD then change it to .vhd format. The dynamic VHD file I hold was the only available option to restore my data that I saved from the virtual PC before un-installing the environment, but when I tried to mount data from VHD I was surprised with the error message that shows inaccessibility of file. I was in utter need of technical help and from the internet search I got to know about the Windows Hyper-V Recovery software, which really helped me in recovering the entire data stored in the VHD files safely into healthy format. We had been looking for a solution that could bring back our data from VHD file in healthy state. But only Hyper-V Recovery gave us the convenience of doing so even without the availability of Virtual Environment on the system. The tool also enabled me to recover deleted partition from (VHD) virtual hard drive. After complete recovery it shows VHD file deleted data into red color. Due to this feature I easily filtered deleted files and folders. For VHD Recovery, I recommend this tool. Thanks a lot. VHD data recovery software is the only one product among all, which equips bundle of eminent features within it. The best thing about this application is that it does not requires any expertise knowledge to work. I really appreciate the hard work of entire development and marketing team for coming up with such a brilliant application. It also support to recover deleted data from VHDX file. So, buy the single tool and recover files from corrupted VHD or VHDX virtual files easily. Best software for Me! Download and Install the Hyper-V VHD Recovery Tool on your Windows (10, 8, 7, and below version). The first window will appear as shown, simply hit on Open button. Now hit on the browse ... button and navigate to the location where .vhd or .vhdx file saved. Select the damaged files and hit on Open. Wait till the VHDX recovery tool completes the recovery process. After that the software will list all recovered folders into Explore panel. 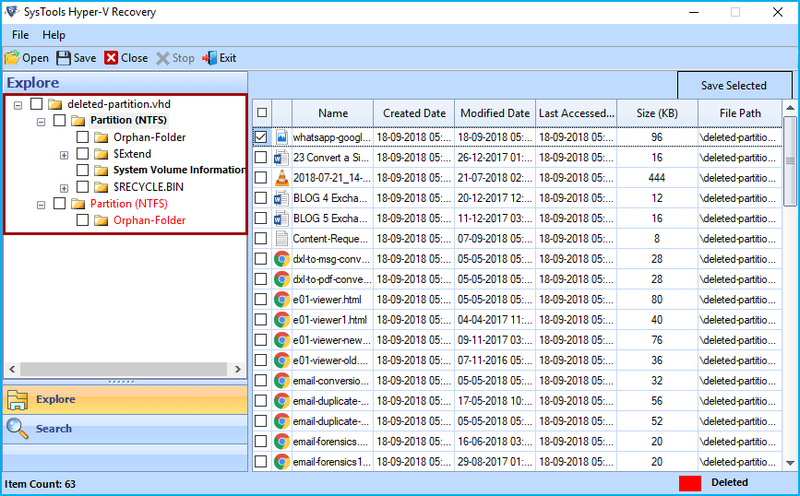 Simply expand the folder and view recovered items easily. Two options to Save recovered VHD or VHDX file items. Either Save complete recovered files or selected file.